Venice is a city full of beautiful palaces and hidden treasures to discover and on my last trip I visited Ca’Rezzonico, a splendid palace designed by Baldassare Longhena a great Baroque architect of the city, for the Bon family. Whilst building of the palace started in 1649, it was halted in 1682 following the death of Longhena at around the same time as that of his client and the palace left uncompleted. But in 1687, Giambattista Rezzonico, a merchant and banker from Lombardy, bought the palace and appointed Giorgio Massari, a renowned and eclectic artist of the time to finish the building for him. By 1758 the palace was completed and was a splendid celebration of Venetian art and a show of wealth and culture. A collection of works, by the most prominent artists of the time. The rooms feature beautiful ceilings and frescoes, painted by Venetian artists, including Giambattista Crosato, Pietro Visconti and Giambattista Tiepolo. In the same year the younger brother of Giambattista Rezzonico, Carlo, Bishop of Padua, was elected Pope under the name Clement XIII. However, this was to be the peak for the palace and the family, as by 1810 there were no family members left. The palace was stripped of its’ furnishings and art works were sold off. The house then passed through many different hands during the 19th Century, before being sold to Venice Town Council in 1935 and now it holds the Museum of 18th Century Venice! Love this little cheeky parrot keeping a watch over one of the doorways of the palace! A rather unexpected addition! I spent a rather dreamy afternoon wandering around its rooms, taking in all the beautiful colours and amazing chandeliers!! I dream of the day when I have a house worthy of an exquisite chandelier . I love looking around palaces and stately homes and fantasising about living in such a grand home and swirling around my ballroom and having a library and a music room (I don’t think that will ever happen – but a girl can dream!)! The museum isn’t full of hundreds of pieces of furniture or loads of information to read, but the palace was so peaceful and has some really special pieces of art to see, definitely worth a visit if you ever find yourselves in Venice! My favourite part was the first floor, eleven rooms with frescoes and bright ceilings, as if only recently painted and of course all the chandeliers! I managed to only really take pictures of the chandeliers, but you can still get a sense of the grandeur and beauty of the palace. 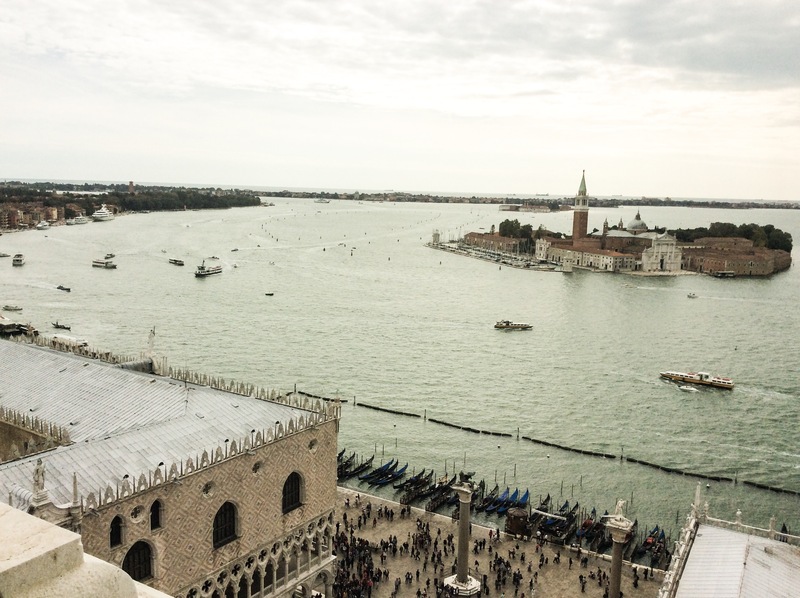 Even after its rather troubled period of financial loss and being passed from owner to owner, the Palace still shines bright and stands proud on Venice’s Grand Canal. 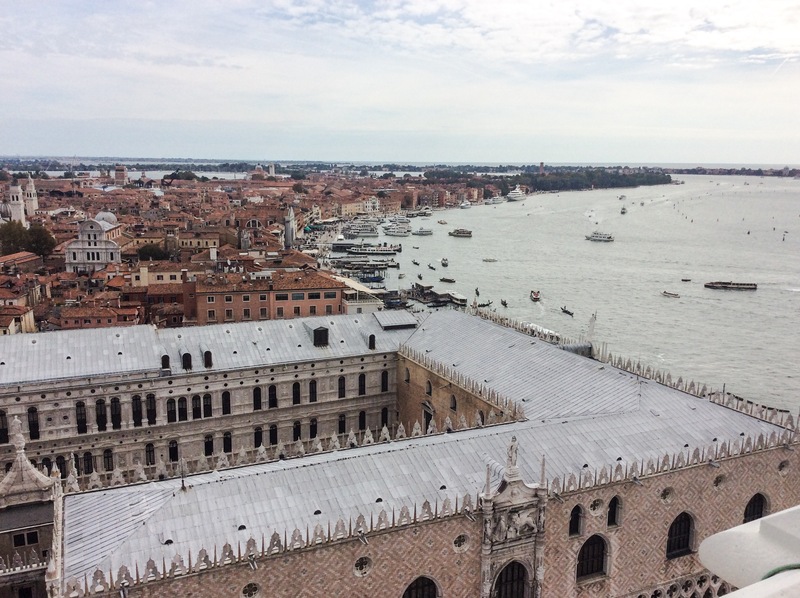 One of the things I highly recommend when visiting Venice, is to go up to the top of the Campanile di San Marco. 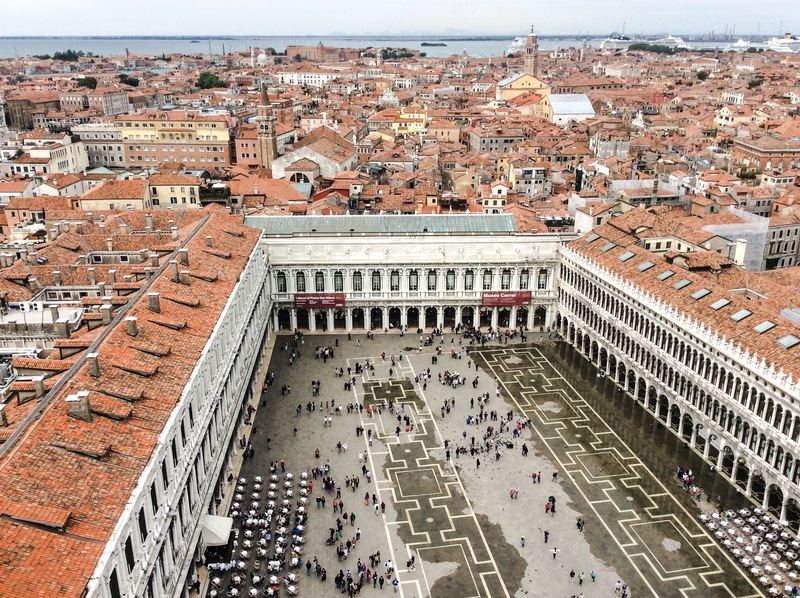 The bell tower standing opposite the Basilica in Piazza San Marco, began its’ life as a watchtower in the 9th Century and was transformed into a bell tower in the 12th century. Other the years, it has suffered various forms of damage from lightning and earthquakes, including a fire in 1489, which seriously damaged its wooden spire. The bell tower took on the form we recognise now, only in the 16th century. Unfortunately I forgot to take a picture from further away! So you can’t see the very top of the tower! 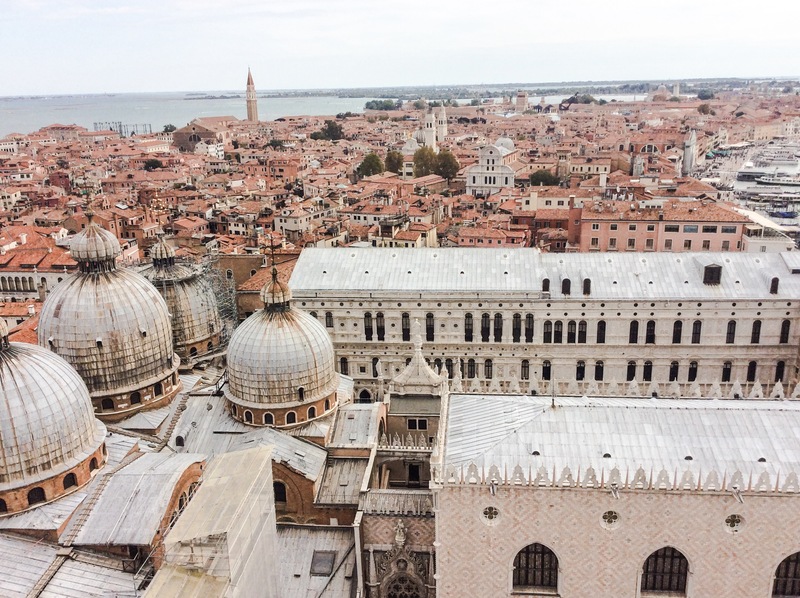 The amazing Iron gates of the bell tower, with the Palazzo Ducale in the background. 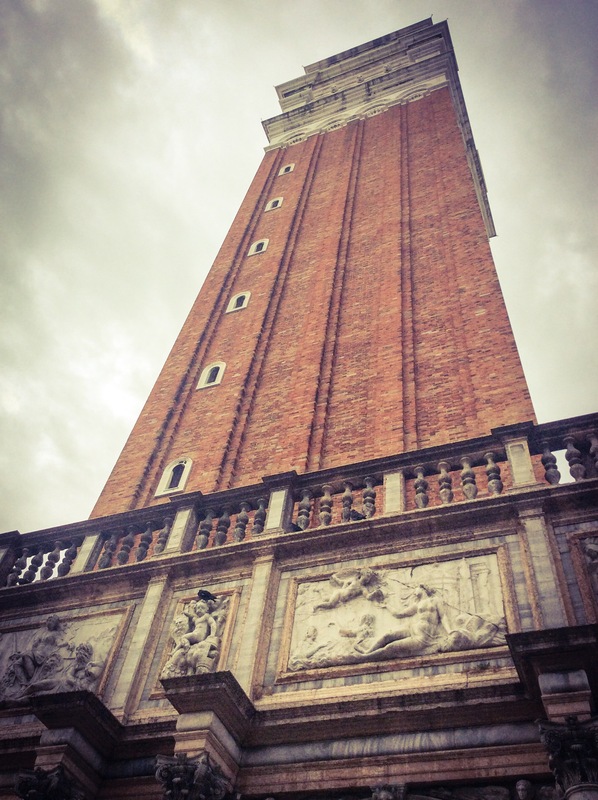 It features a solid square brick tower, topped by the belfry which houses five bells, on top of which is a cube, with alternate faces showing the Lion of St Marc and La Giustizia, a female representation of Venice. On top of the cube is a pyramidal spire, with a gilded statue of the Archangel Gabriel holding a lily, completing the tower. The tower stands at 98.6 metres (323 ft) tall and is 12 metres (39 ft) wide. There is a lift which takes you to the bells and the viewing platform. 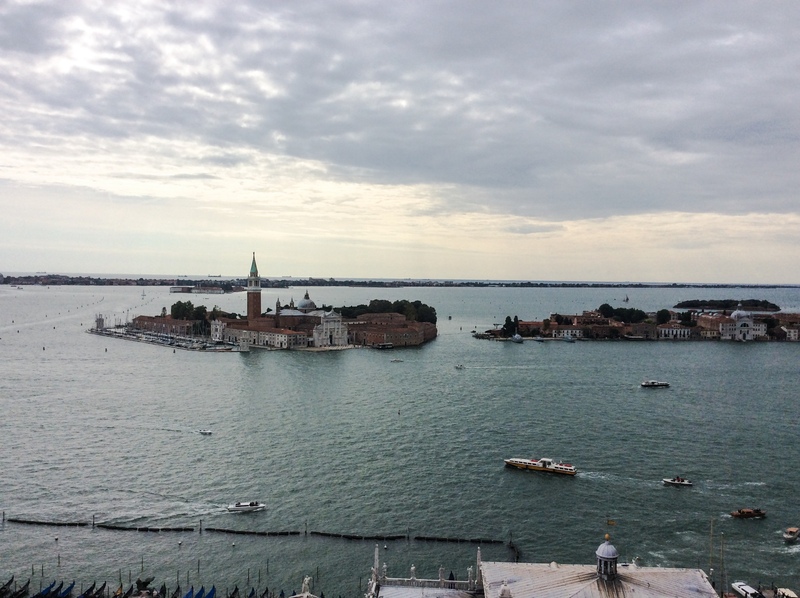 There you have 360 degree views of Venice! 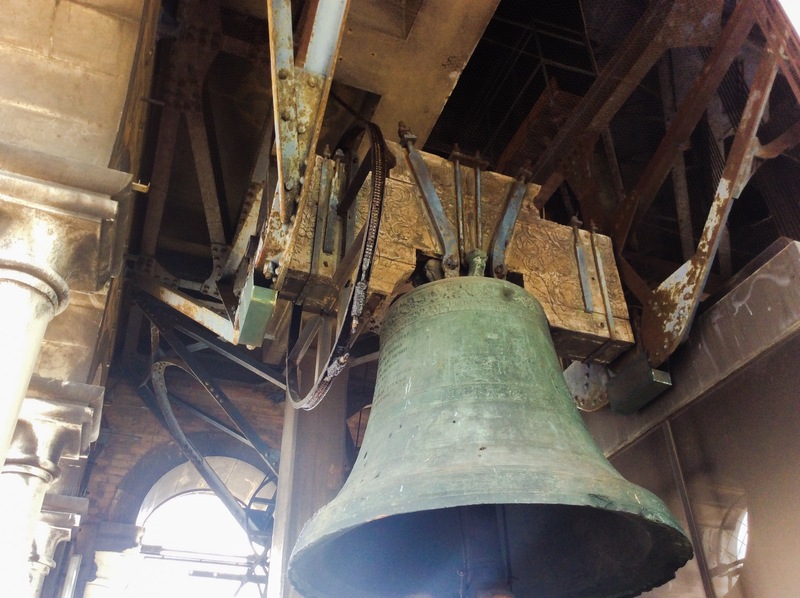 The five bells of the Campanile, each had a different purpose! 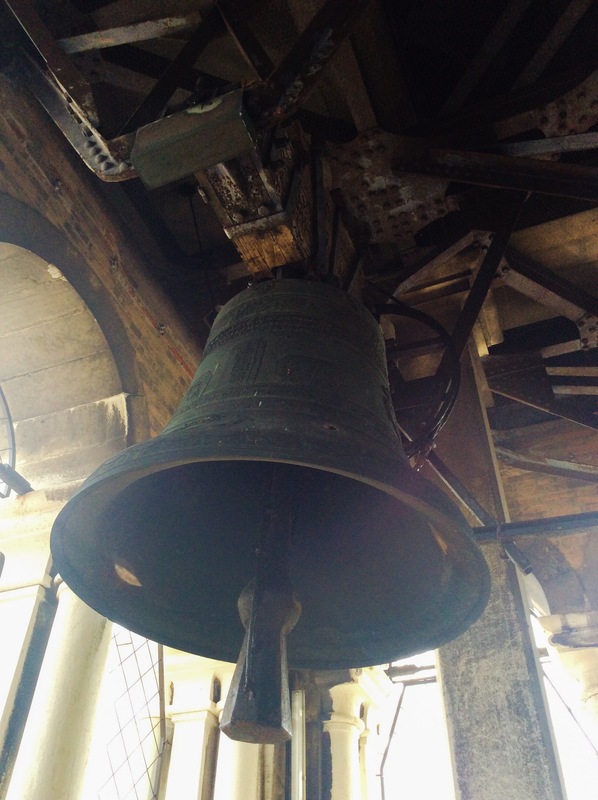 The five bells of the Campanile, were each rung to mark different occasions, although all were tuned to the Scale of A. The largest Marangona, was rung to mark the beginning and end of the working day; the Nona, sounded at midday; the Trotteria, called members of the Maggior Consiglio to council meetings, the Mezza Terza, signalled a session of the Senate and the Renghiera or Maleficio, announced executions! 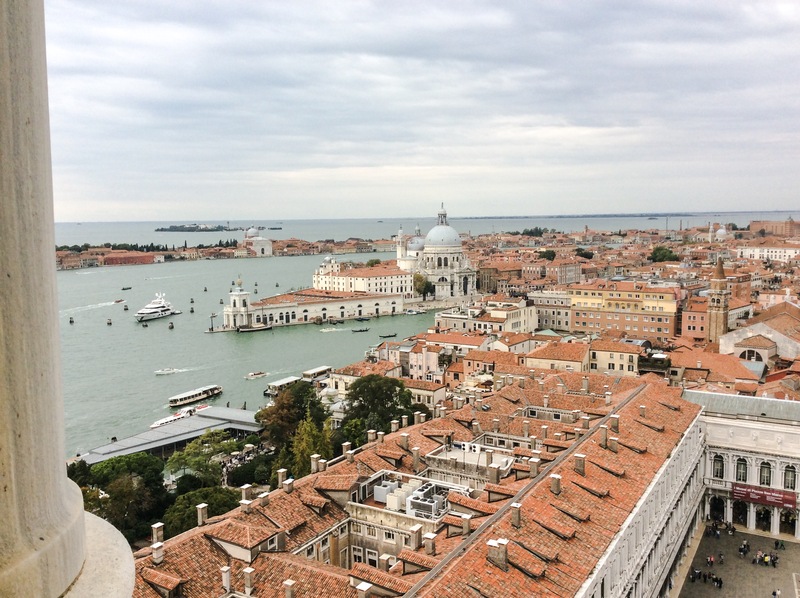 After the tower had taken on its final form (between 1511 and 1514) it stood proudly in the square and became a landmark of Venice. However, on the morning of July 14th 1902, cracks started to appear in the bell tower, which quickly spread and before long the tower had crumbled to the floor, leaving only a pile of rubble! The way the tower fell caused very little damage to any other buildings in its vicinity, and I read that the only fatality was the caretakers cat! Poor thing! The Campile, which had become a landmark of the city and known world over, was rebuilt in less than a decade to its original design, height and width and was reopened on the 12th April 1912, supposedly exactly one thousand years after the foundations of the original tower had been laid! 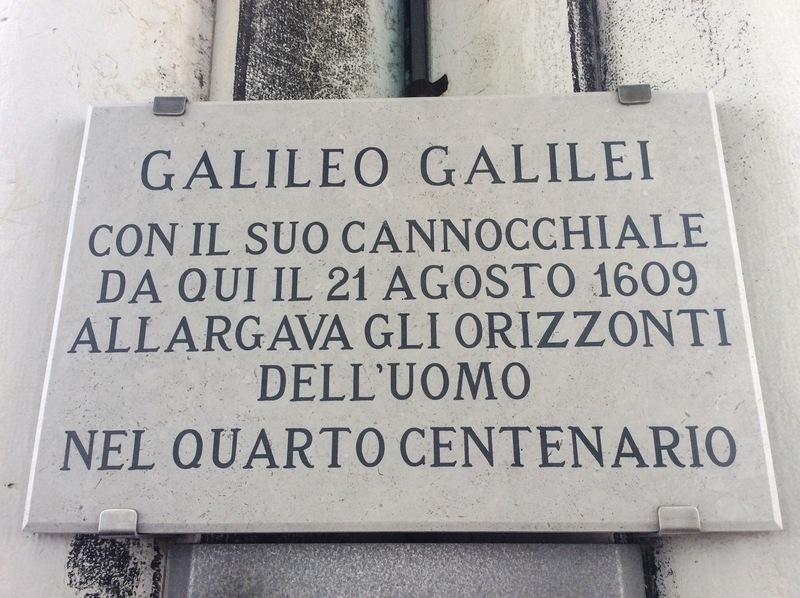 This plaque commemorates how Galileo Galilei demonstrated his telescope to the Duke of Venice Antonio Priuli on the 21st of August 1609. 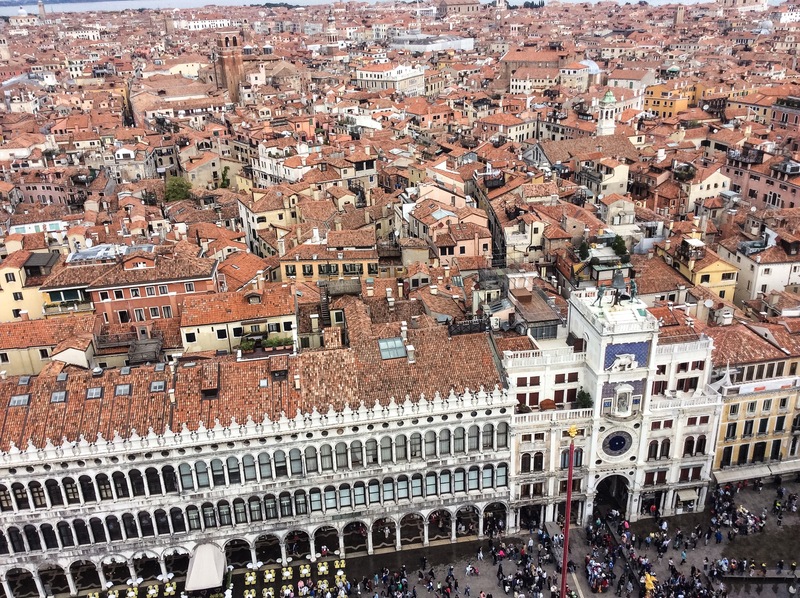 Here you can see the Duke’s Palace to the right and the top of the Basilica di San Marco on the left. 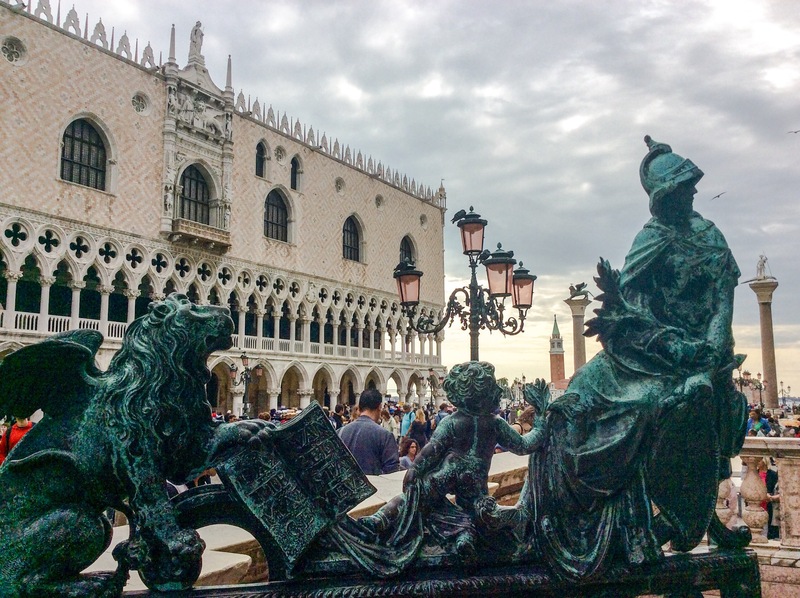 Piazza San Marco – which was slightly flooded when we visited! The views from the top are magnificent and truly worth the queues! Wrap up warm though…as it gets really quite windy up there!! And make sure you don’t forget your camera! 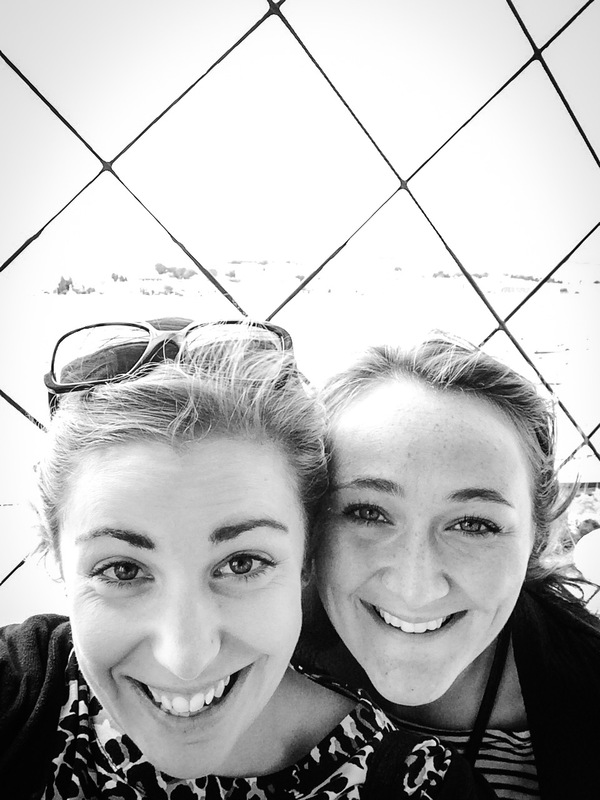 Here we are looking very happy to be re-united in Venice – just slightly windswept and cold! !